A blue plastic barrel slowly revolves in the space; its mechanized armature supports lenses and light bulbs. The surface of the barrel has been carved and abraded. As the lenses focus the light an illusion of a vast open body of water emerges. The structure becomes marooned, peacefully spinning somewhere between the isolation of its projected abyss and a paradise island. Organizer: Charlotte Becket lives and works in New York City where she is an Associate Professor at Pace University. She attended Hunter College’s MFA program and received her BFA from the Cleveland Institute of Art. Solo and two person exhibitions include Valentine Gallery NY, Crisp Gallery in London, LEAP in Berlin, Taxter and Spengemann in New York City as well as group exhibitions at Gazelli Art House in London, Anna Kustera, Lorimoto, NY Studio Gallery, Passerby and the Invitational Exhibition Academy of Arts and Letters in New York City. She has been invited to lecture on her work at various galleries and universities and has been the recipient of grants from The New York Foundation for the Arts, Socrates Sculpture Park, The Joan Mitchell Foundation, The Tony Smith Foundation, and the Verizon Foundation. Her work has been reviewed in The New York Times, TimeOut London, ArtForum, and Art in America, among others. She was recently included in, 100 Artists, a compendium of interviews with 100 international contemporary artists by Francesca Gavin. Organizer: Rebecca works in diverse forms such as installation and sculpture. It often examines concepts and material of 16mm filmmaking to explore perception, narrative, linear thinking; where time loses the marker of meaning. Her work explores the loopholes between things, the clash. The conflict. The paradox of. Where opposites meet and create coherency. 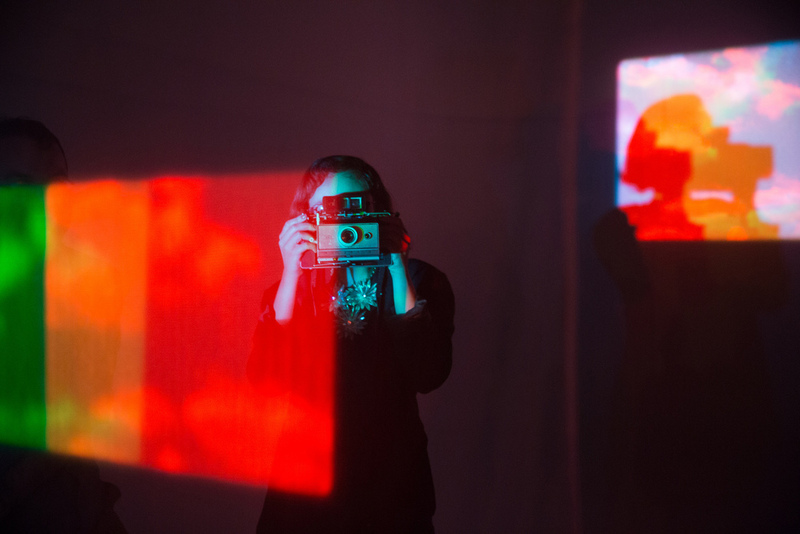 Schmid’s 16mm film installation is based on James Clerk Maxwell’s method of additive colour-mixing that led to the creation of the first colour photograph in 1861. A section of cloudy sky has been filmed thrice on black and white film, each time through a differently colored filter (red, green, blue). Projected through corresponding filters, the images appear on three screens in degrees of overlap, resulting in a layered distortion of the conventional image of blue sky and white clouds, seeking to reveal the cinematic apparatus behind the composition. The mechanics of the film image become a palpable experience for the viewer. The clouds’ ephemeral state of constant motion reflects the variable nature of the image’s final appearance. Scratches and dirt marks on the hand-processed material and variations in projector speed underline the impression of fragility that is an inherent component of works on analog film. Organizer: Viktoria Schmid is a visual artist, DJ, filmmaker and musician from Vienna, Austria. She attended the “Friedl-Kubelka- School” in Vienna and graduated from University of Art in Linz (MA). She creates work for the exhibition space as well for the cinema. A time-lapse of motion and vocal blur animated by a fractal form that builds and reverses, coincidentally in the time equivalent of pi. Organizers: Timothy David Orme is a writer, filmmaker, and animator. His two books of poems, Catalogue of Burnt Text, and his second book, Oponearth, are available through BlazeVOX Books. His films have won international awards and shown at film festivals all over the world. Kir Jordan writes poetry, does editorial work, and collaborates on film and visual art projects. Most recently she appeared in a film shot by Nathan West for Yuka Honda and Nels Cline’s in situ performance at National Sawdust. She lives in Brooklyn with her partner and menagerie of pets. “Grant Park” experiments with the process of photosynthesis and chlorophyll, which uses sunlight to print 16mm image sequences onto leaves. The images/leaves are attached to celluloid creating an animation of the Grant Park location where the leaves were collected. The film illustrates the Grant Park landscape and the park’s history through the process of photosynthesis. The film sequence is of scenes I’ve filmed in the location where I gathered the leaves for printing as well sections of found footage from a photosynthesis educational film. The film negatives are contact-printed on to the leaves utilizing the process and then each leaf image is placed in sequence onto 16mm clear celluloid for projection. Brooklyn-based experimental musicians Pas Musique will provide improvisational, sound accompaniment using theremins, synthesizers, and various percussions to establish cinematic, lush soundscapes. Organizers: Robbie Land: Born in Jacksonville, Florida, Robbie began working in film specifically super-8mm producing animations and live action experiments. He has worked on a variety of projects from cinematographer at the Florida Lightning Research Facility to teaching college level photography, film and sound production. Currently he resides in Atlanta, Georgia and continues to experiment with various photo-based and sound projects for exhibition of installations, film screenings, performance and photography. Robbie’s work has been exhibited at Kunst Film Biennale in Cologne, Germany, Museum Do Chiado in Lisbon, Portugal, The International Experimental Cinema Exposition in Denver, Colorado, Scientifical Center Espace Mendès in Poitiers, France, Museum of Contemporary Art Georgia in Atlanta in addition to a variety of screenings and exhibitions. Pas Musique started in 1995 out of Brooklyn, NY, USA, driven by the creative talents of Robert L. Pepper working in the mediums of sound and video. Pas Musique have performed in 14 countries and all throughout the United States. Pas Musique have collaborated with artists like John 3:16, Philippe Petit, Rapoon, and Chester Hawkins. Pas Musique also curate events in New York such as Experi-MENTAL nights, Ambient-Chaos nights and the Experi-MENTAL Festival once a year. Pas Musique are Michael Durek, Amber Brien, Jon Worthley, and Robert L. Pepper. A view through cracks between fish markets and high-rise buildings; urban imagery of Hong Kong and the indulgence of domestic life. Massage parlors, dim sum parlors, nail parlors —its Parlor City, baby! Hyperactivity: a sausage dog chews on a rib-eye bone while a Filipino family prepares a dinner of three to four different ethnic cuisines. Incited by the airy weight of digital platforms and their approaches, I imagined ironing flat potentially conflicting 16mm negatives via an industrial contact printer. Views thicken; detail lost over generations. A dream of turning two images into one; a density of information reserved for the modern cloud. Organizers: Simon Liu lives and works in Brooklyn, New York. Born in Hong Kong and raised in both Hong Kong and Stoke-On-Trent, England, he moved to New York in 2006 and received his B.F.A. Degree in Film and Television Production from New York University’s Tisch School of the Arts. His work has been exhibited internationally and throughout New York. Selected screenings and exhibitions include: Centre Georges Pompidou, Paris, France; Werkstatt Der Kulturen, Berlin, Germany; Rio De Janeiro Film Festival, Brazil; WNDX: Winnipeg Festival of the Moving Image, Winnipeg, Canada; Marfa Film Festival, Texas; Microscope Gallery, New York. Warren Ng is a San Francisco-born, Brooklyn-based experimental guitarist who draws from minimalism, drone, free-form improvisation, and noise. He has performed and recorded solo and collaboratively under the names This Invitation, Somnambulists, and A Blanket of Snow. His releases include: This Invitation’s “The Skin of Light” (2004) and “Sunless / Ellipses, Lapses, and Collapses” (2010); and Somnambulists’ “At Daybreak the First Greyness to Emerge” (2010) and “The Invisible Score” (2010). He also appeared on the compilation “Music for Plants” (2005) and participated in Rhys Chatham’s “A Crimson Grail (for 200 Guitars)” at Lincoln Center in 2009. Ben Hozie is a 27 year old DIY filmmaker and leader of the art rock unit Bodega Bay. He has directed two feature films: ‘Annunciation’ (2014, 16mm) and ‘The Lion’s Den’ (TBA, HDV). Bodega Bay released their debut double LP ‘our brand could be your life’ in June 2015 and plays weekly in NYC. As two growing years pass, Don Zeghers – farmer from Holland, Manitoba – phases out his multi-generational family farm. With experimental photography on Super 8, 16mm and digital mediums, his son Aaron Zeghers follows this life change. The dissolution of the family farm is seen both intimately but also as a microcosm of the modern industrialized world. Nature is contrasted with industrial might in this sentimental and existential portrait of one’s own family. Organizer: Aaron is a Winnipeg-based artist working in film, video and photography. He is often found working with analog mediums, found footage, lo-fi technology and experimental processes. Zeghers is a founder of the Open City Cinema collective and the Winnipeg Underground Film Festival. Zeghers’ films have played in marginalized venues the world round. Zephyr is a Toronto based performance duo consisting of filmmaker Sylvain Chaussee and composer Adrian Gordon Cook. Through this collaboration they explore the relationship between their respective mediums. Both image and sound are created from analog sources, with Chaussee’s extensive manipulation of 16mm film, as well as Cook’s improvisations on synthesizers and sequencers. Their aim is to provide an immersive and expressive cinematic experience based upon various themes. In Vista they navigate the viewer through the natural landscape with an emphasis on movement, colour, texture and tone. Organizers: Sylvain Chaussée (b.1988) is a filmmaker and photographer born in France and based in Toronto, Canada. He studied film at Concordia University with experimental filmmakers Richard Kerr and Francois Miron. Chaussée’s work focuses on the materiality of his medium, which is realized through extensive processing and printing techniques. As a film technician at Niagara Custom Lab he strives for an alternative approach towards filmmaking. In performance, loops provide the basis for his imagery, through which the repetition of movement, colour, and texture are integral to the experience of the work. Chaussée is inspired by the physical nature of film, which permits limitless opportunities for manipulation and transformation. Adrian Gordon Cook (b.1988) is a composer, performer and multi­-instrumentalist based in Toronto, Canada. He studied music at York University, where he focused on composition, electronic media and music history. Largely inspired by early minimalist composers, such as La Monte Young, Steve Reich and Philip Glass, Cook’s work takes shape within large temporal boundaries, utilizing drones, repetition, prolonged chordal movements and static harmony. A guitar player at heart, Cook is equally intrigued by the pedal steel guitar, keyboard instruments and tape machines. He has a keen interest in multi­-disciplinary work, influenced by the new relationships formed when sound is not the sole aspect of a piece. Daniel McKernan is a New York-based artist, musician and curator. He has collaborated on live performances and visuals for numerous musicians, including Coil, Thighpaulsandra and Cyclobe. His debut EP as experimental synthpop duo Protection was released on the new label, Formlessness Press. His short films and video installations have been exhibited at institutions around the world, including the Museum of Modern Art (New York), the Brooklyn Academy of Music, La Mama Galleria (New York), the Andy Warhol Museum (Pittsburgh), the Yerba Buena Center for the Arts (San Francisco), the Horse Hospital (London), and others. His artwork, interviews and editorials have been featured in The Wire, V Magazine, VMAN, PLAYGIRL, Brainwashed, Noisevox, Satanica, Flavorpill, K48 and THE FUN published by the Museum of Art & Design. The images here are adapted from experimental tools used in psychological studies spanning several decades. Against these faces and face-like things, an abstract text imagines a perspective floating somewhere between test subject and researcher. Mike Newton is an artist and writer based in Brooklyn. His work is (usually) about finding bits of human subjectivity at the intersections of complex and generally-incompatible systems or ideologies. He’s an editor and contributing writer for the arts magazine Secret Behavior, and a regular contributor to NYC-based progressive newspaper The Indypendent. He is not to be confused with another Mike Newton who lives nearby. During his thirty-year-plus career, Vito Ricci has scored over fifty productions including concert music, theater, dance, performance, film and video. His collaborative works include partnerships with Bob Holman, Martin Goldray, Rashied Ali, Flux Quartet, Jacob Burkhardt, Lise Vachon, and The Woster Group. Performances of his works have been produced at The Skyball Theater, The Public Theater, Greenwich Music House, Cooper Union, Roulette, The Knitting Factory, St. Marks Church, The Performing Garage, the Walker Arts Center and the Southern Theater, both in Minneapolis, and the Sedgwick Cultural Center in Philadelphia. Night Visions developed as an audio/visual conversation about sleep cycles, psychic energy and synesthesia. The result is a haunting spell of color and rhythm. Zoe Kirk-Gushowaty is an artist working experimentally with moving image and sound. She works primarily with 16mm and 8mm film incorporating live elements of sound and performance in exhibition. Her work has been presented in Canada, USA, Europe and Japan. Zoe is a founding member of the Iris Film Collective in Vancouver, Canada. Stephanie Gould, originally from Melbourne, Australia is a visual artist with a special emphasis on photography and filmmaking. Her recent work in particular focuses on documentary, music and movement. Brighid Greene is a freelance performer with a background in dance, a tendency towards live performance, and an affinity for film. Two Aries that are simultaneously the same and different. Josh Weissbach is an American experimental filmmaker. He lives in a house next to an abandoned village in Moodus, Connecticut with his wife, daughter, and three cats. His cinematic practice primarily focuses on the relationship between the intimate and the uncanny within domestic spaces. Central to this process is an investigation of the visual agency of the (un)built form and the manner in which it implicates a history of familial trauma. His practice also considers natural spaces that are defined by the vitality of matter and its transfer of force. His 16mm films and digital videos have been shown worldwide in such venues as Ann Arbor Film Festival, 25 FPS Festival, Berlin International Directors Lounge, Antimatter Underground Film Festival, Festival Internacional del Nuevo Cine Latinoamericano, UnionDocs Center for Documentary Art, Experiments in Cinema, and Cannes Film Festival Short Film Corner. He has won jury prizes at Iowa City International Documentary Film Festival, $100 Film Festival, Onion City Experimental Film and Video Festival, and Haverhill Experimental Film Festival. He is the recipient of the 2008 Cary Grant Film Award from the Princess Grace Foundation-USA, a 2013 Mary L. Nohl Fellowship for Emerging Artists from the Greater Milwaukee Foundation, and a 2015 LEF Fellowship from the Robert Flaherty Film Seminar. Second Star is a sound performance for moving image mechanics. Black and white text is laser-printed onto clear 16mm film, assembled into loops and translated into rhythm and tone by an analog projector. Photographic tradition is eschewed in favour of something invested neither in abstraction nor representation, reimagining the potential for an obsolete technology. Reflectors is the result of an all new collaboration between Sam Hoolihan, John Marks, and Crystal Myslajek. The work creates a resonant synthesis of vertically structured film and sound. The images are composed of double and triple exposed Plus X, Tri X, and Ektachrome 16mm film stocks, by layering images on top of one another multiple contexts resolve within single frames. The sounds, in response to the film, are constructed of live-looped vocal and keyboard passages that are supported and processed by modular synthesizer building textures that take on a topographical form. Sam Hoolihan is a Minneapolis-based visual artist and teacher blending photography, film/video, and performance. His films have screened in Brooklyn, Chicago, San Francisco, and Los Angeles. Sam has been a resident artist at Elsewhere Artist Collaborative in Greensboro, North Carolina, and Art of This Gallery in Minneapolis, MN. He is co-founder of MirrorLab, a studio, film lab, and project space for explorations in integrated art forms. Sam is currently teaching handmade cinema and media arts at both MCAD and the University of Minnesota in 2015. John Marks is a Minneapolis-based artist, performer, and curator working at the intersections of media, music, and visual art. John’s work has been presented at the Walker Art Center (Minneapolis), Mono No Aware Vlll (Brooklyn), Milwaukee Underground Film Festival, Slamdance (Park City Utah), Minneapolis / St. Paul International Film Festival, Cellular Cinema (Minneapolis), Roman Susan Gallery (Chicago), and Northern Spark (MN). He served as co-curator of The Soap Factory’s 2013 Minnesota Biennial, The Tuesday Improvised Music Series, and co-founded Art of This Gallery, and MirrorLab (Twin Cities). Crystal Myslajek is a multi-instrumentalist and composer who writes and performs accompaniment for post-modern dance, performance and film. In her work she blends looping, ethereal vocals, and effects with minimalism, classical piano, and pop. In January 2015 she performed new multimedia compositions commissioned by the Cedar Cultural Center’s 416 Club. Myslajek’s improvisational piano work was featured on a limited-edition-vinyl release as part of the Soap Factory’s 2013 Minnesota Biennial. Myslajek was lead vocalist and bass guitarist in the critically acclaimed art-rock trio, Brute Heart, whose music was featured in Doug Aitken’s Station to Station project in 2013. With Brute Heart, she was awarded City Pages’ Best Female Vocalist, commissioned by the Walker Art Center to compose and perform a film score for The Cabinet of Dr. Caligari, and released recordings for the Soft Abuse, M’Lady’s, Moon Glyph and Water Wing labels. Culled from a period of life during which the experience of time ceaselessly expands and contracts, when a day can feel a lifetime and a year little more than a train ride. An ongoing project, a living work; something like a notebook in which I am just as likely to draw a picture as to tear out a page. Films and photographs I’ve collected over the past seven years, abstractions, byproducts of process, accidents, animations, notes, sketches, essays, poems, doubts and dreams; almost entirely camera originals. A celebration of the everyday, of the capacity for vision. An invitation to appreciate the beauty and pathos of the seemingly mundane. Multiple projections, manipulated and performed with a live score, moving with the music, this piece allows each moment the weight I feel it deserves. It is my song. Craig Scheihing is a filmmaker, photographer, curator, educator, and the founder of Big Mama’s Cinematheque; based in Philadelphia and working freely between diary, essay, and abstract forms. His films have been screened in film festivals, basements, bars, batting cages, galleries, and garages both in the U.S. and internationally. Christian Bach is a Philadelphia based drummer and percussionist. He has performed in a variety of musical settings since 2008 – most notably as a founding member of the grind project Congenital Death. Justin Fox is a Philadelphia based musician. A current and past member of Kite Party, Queen Jesus, Spirit of the Beehive, and Cherry, Justin is most interested in guitar work that is textural, lyrical, and simple. Kevin P. Keenan VIII is a carpenter and experimental musician based out of North Philadelphia. Since 2008, he has been writing and performing with two-piece experimental rock band The Joint Chiefs of Math. Jesse Kennedy is a musician, photographer, and filmmaker living and working in Philadelphia. Kian Sorouri is a musician based in Philadelphia. Gabby Eisenhower is a witch and musician living in the suburbs of Philadelphia. She plays in the band Marge and makes simple solo songs on her computer. Sal Principato is the vocalist for Liquid Liquid, the New York City post-punk, post-disco band, originally active from 1980 to 1983. Since reforming in 2008, the band has played a select number of shows including opening for the LCD Soundsystem farewell show at Madison Square Garden. Sal produces remixes and often tours as a DJ. Inspired by hometown heroes DJ Excel and DJ Jazzy Jeff, DJ Bruce found his way to a pair of turntables his sophomore year of university in Philadelphia. Since then, he has allowed his authentic musical tastes to take front-and-center of his journey. From his first Philly nightclub residency at 19 to remixing for independent tastemakers such as A-Trak’s Fool’s Gold Records and Young Robots, he quickly earned a reputation for his work ethic and tight groove. Since relocating to New York in the Spring of 2013, Bruce has been a key member of Razor-N-Tape, a purist Brooklyn vinyl/digital label and has produced disco and boogie edits under the umbrella of “STRONG Edits” that have made their way from the web to the dancefloor. He considers himself fortunate enough to have held residencies across multiple boroughs, perform on both coasts, and take on the role of music director at Brooklyn cocktail lounge favorite: Donna. Armed with his open format approach to djaying, Bruce has been able to successfully traverse worlds ranging from velvet ropes to the sweaty dance floors of the underground.